The Universe (the World in the Rider-Waite tradition) corresponds to the Hebrew letter Tav, symbolizing a stamp or seal. Tav is the last letter of the first word of the Torah, symbolizing the ultimate origin, and the end process of creation. It is also the last letter of the Aleph-Bet, causing it to act somewhat like a seal, capping the end of existence and providing it with the authority of truth. However, as the letter Tav is only the last letter of the first word in the Torah, it is implied that there is continuation after the end. So while this is a letter of endings, it is also a letter of new beginnings. It is a sign of righteousness symbolizing life eternal, and the continuation of existence even after the end (such as the World continuing on after the Judgement). This letter is extremely appropriate to the last of the Major Arcana. The Universe means all of these things that the letter Tav does; it represents both the end and the beginning, as one journey ends and another begins, and also represents the state of the world at the end of things, summing up all that came before it. Astrologically, the Universe is equivalent to Saturn, which is the Planet of limitation and discipline. It represents slow growth through experience, and getting exactly what you deserve; no more and no less (a form of righteousness). It represents coming to your full self along with the rest of the world, simply by living in it. And the Universe as a card represents very much this ideal. It represents harmony and the world, and absolute completion and fulfillment; the zenith of one’s life. 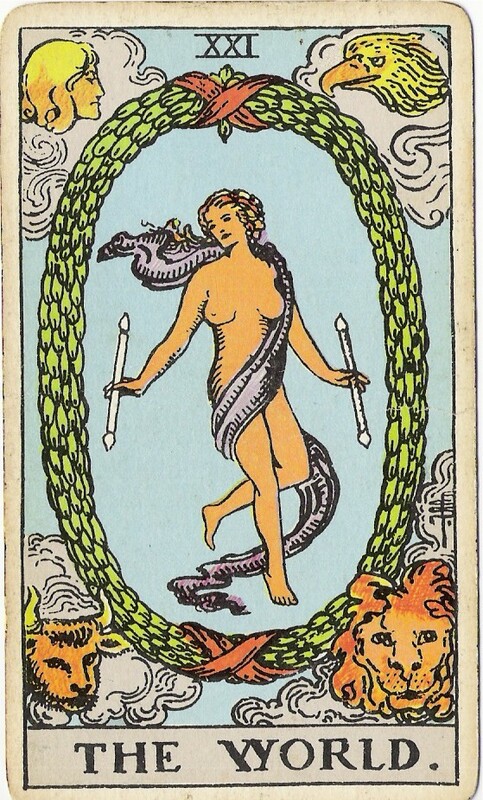 The Universe is the card that comes at the end of the Fool’s journey, and represents his spiritual being at that point, full of experience. He has learned the ways of the world and has become fully integrated into it, accepting his place there. The journey has ended, but a new one will soon begin. This card represents one being at peace with themselves in the world, finally realizing who they are and how they should live. It represents combination and fullness, and the whole picture coming together. It is the realization of the Fool’s potential. On the Tree of Life, the Universe stands between the Sefirot of Yesod (Essence of Being) and Malkuth (Reality) – it represents what happens when one comes into Reality having fully realized who they are themselves (Essence of Being), which allows them to accept their place in the larger world (Reality). In a reading, this card asks you to examine the role that you sense of self-identity and the world play in your life. It asks you if you are sure of who you are and where you should be. It advises you to start looking for a new beginning, for the journey you have been on may soon be ending. Are you well-integrated into the world? Reversed, this card’s energies are hidden, blocked, or twisted somehow; perhaps the universe you are integrating to is smaller than you think, or your fulfillment is hollow – or perhaps you have gotten more or less than you should have out of your recent journey. This entry was posted on July 6, 2011 by Z. M. Wilmot. It was filed under Tarot .